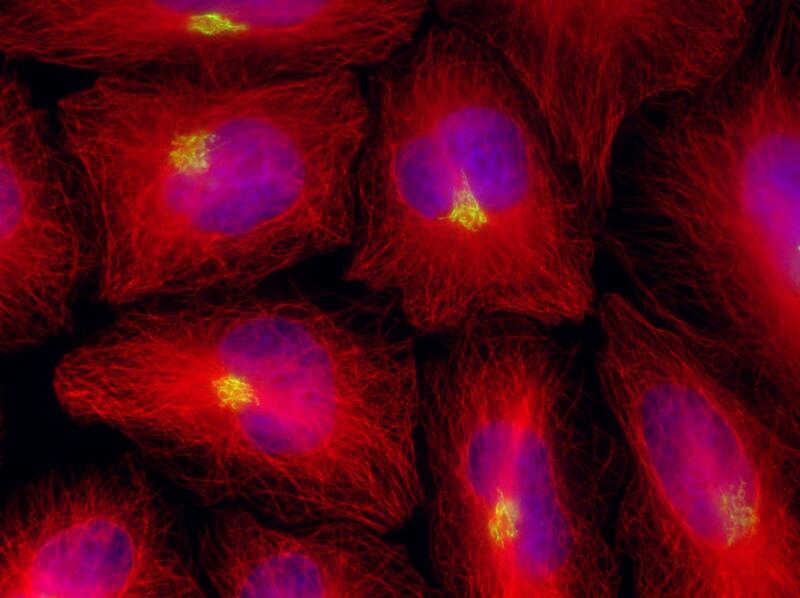 My research focuses on microscopic proteins that can literally walk around inside your cells – pretty cool, no? I’m a cell biologist so, unsurprisingly, my research focuses on cells – specifically how stuff moves around inside them. Whether they are heart cells, brain cells, skins cells or any other kind, all cells are jam-packed full of microscopic structures called organelles. Just like our body has different organs that keep it ticking over, a cell has different organelles that do certain jobs to keep it alive. All these tiny organelles are constantly moving around inside our cells and I’m interested in why and how they do that. Each cell in your body has a network of microscopic tubules, imaginatively named microtubules, which span the entire cell like a (slightly messy) spider’s web. This network of microtubules acts as a transport system for organelles to move along. This is a picture I took of the inside of some cells – it looks better if you click on it! The micrtoubules have been dyed red. The nucleus has been dyed blue. A cell organelle call the Golgi apparatus has been dyed green. Now the heroes of my PhD story are molecular motors. These molecular motors are made out of protein and are so small they can only just be seen with the most powerful electron microscopes. They have two tiny legs, which they can use to literally walk along microtubules. The molecular motors can grab onto different cargo and carry them to somewhere else in the cell. This cool video shows an animation of them in action. I work on dynein, which is the one – to quote my Mum ‘That’s wearing high heels and keeps walking into to stuff’. I’m interested in what makes dynein grab onto certain organelles and move them rather than another cargo. I grow human cells in dishes and play about with the conditions to see how it affects the dynein-cargo interactions. The lab I work in tries to find out how these molecular motors work under normal conditions in cells. Hopefully one day this information can be used to work out what happens when molecular motors don’t work properly and how that can affect progressions of illnesses like cancer and neurodegenerative disease. The main reason I research molecular motors is because I think they’re well cool. I mean, we all have tiny proteins walking around in our cells right now – I just want to know as much about that as possible. Dynein has those extensions that only move in one direction right? Bend like wings when moving back to ready position? Yep, dynein only walks in one direction – usually toward the centre of the cell (it depends on how the microtubules are orientated, they have a plus and minus end – dynein goes from plus to minus). Dynein is thought to step backwards sometimes, but bi-directional transport is done by dynein and another microtubule-associated molecular motor, kinesin (most kinesins walk towards the plus end of microtubules), working together. There are also actin filaments in cells, that a different type of molecular motor, called myosins move along and carry cargo. These are also the same proteins that make muscles contract.